When you're a lame-duck government that has promised so much and delivered so little, what do you do? You look for a diversion to take the attention off your lame-duckness. So following a tried and true formula, Australia's coalition government, headed by lame-duck Prime Minister Malcolm Turnbull, looked for a political scalp to use as said diversion. They found it in Senator Sam Dastyari, a junior member of the Labor opposition in the Senate. Dastyari had received donations from wealthy Chinese businessmen, including one Huang Xiangmo. Dastyari used these donations to pay a personal legal bill. There was also a 15-day funded trip to China, he allegedly warned Mr Huang that his phone may be tapped by ASIO(1), and lobbied Tania Plibersek, a fellow Labor Party senator and foreign affairs spokesperson, to not meet pro-democracy activists who opposed Beijing's interference in Hong Kong, when she visited Hong Kong in 2015(2). Dastyari was caught on tape defending China's policy in the South China Sea, which differed to the Labor Party's position on the matter. He also lobbied the Immigration Department for Mr Huang to be granted Australian citizenship(3). The government maintained the attacks on Dastyari for more than 12 months and finally, not surprisingly, he resigned from parliament. While Dastyari may have acted erroneously, he wasn't the only politician receiving money from wealthy donors ... Chinese or otherwise. 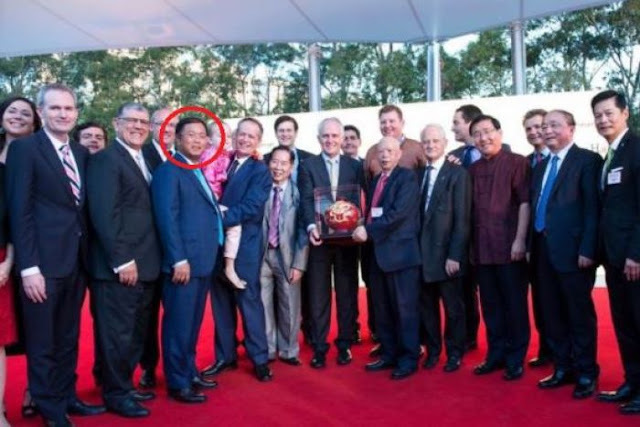 Mr Huang's Yuhu Investment Trust donated hundreds of thousands of dollars to the Liberal Party and the Labor Party(4). Some of these donations went to senior members of the Liberal Party's cabinet, namely Defence Industries Minister Christopher Pyne, Finance Minister Matthias Corman and Foreign Affairs Minister Julie Bishop, who also doubles as Deputy Leader of the Liberal Party. The Coalition claims that the donations to them are different to the donations Dastyari received because these donations were only used for election campaigns not to settle private bills(5) ... why would China be so interested in getting certain politicians elected? Using donations to pay a private bill is bad, but undermining the democratic process is good if one follows Liberal Party logic. The Liberal Party claims that the donations they received from Mr Huang and Yuhu supposedly didn't influence the recipients or party policy. But who would know? Dastyari was a junior Senator, he held no portfolio. For him to influence anyone he had to lobby others which was quite noticeable, as he did with Tanya Plibersek. However, Bishop, Pyne and Corman are ministers, they are the decision makers, they need lobby no-one, making it much easier to hide any influence. The Chinese-owned Top Education Institute is a top donor of money to the Liberal Party, and has received preferential treatment through a streamlined visa program for Chinese students, and is the only non-university provider whose law degrees are accredited by the Australian government. Interestingly, both Christopher Pyne and Julie Bishop are former Education Ministers. The former Labor government dismissed the streamlined visa program for Top Education Institute. The Liberal Party government granted it, coincidentally after receiving a $45,000 donation from the Institute at around the same time that the Institute paid a personal bill of $1,600 for Dastyari(6). Surely, people are not naive enough to think that big money flowing into government isn't going to influence government decisions? Business people do not drop hundreds of thousands of dollars on politicians out of the goodness of their hearts. Of course, it is not just the Chinese who are donating, however it is the Chinese who the Liberal Party has focussed on. As Dastyari was preparing to resign from politics, Prime Minister Turnbull announced a crackdown on donations from foreign entities and non-citizens, amid warnings from ASIO of attempts by the Chinese government to influence Australian politics(10). So on one hand, the government accuses Dastyari of being influenced by China while denying any such influence within the Liberal Party, and then proposes a bill that specifically acknowledges attempts by China to influence the government while the Liberal Party has been happily accepting Chinese donations. Political donations by businesses, foreign or domestic, should be banned. There are reasons that businesses donate so much money to political parties. Donations of this nature and magnitude are more commonly known as 'greasing the wheels'. Business donations undermine the democratic process and instead of enhancing Australian society, actively work against the needs of the many for the interests of the few. The Liberal Party has also tried to ban union donations to the Labor Party. However, union donations are different to business donations. Firstly, Labor was formed out of the Union movement, so there is no great conspiracy or surreptitious relationship between unions and Labor ... as much as the Liberals try to make out that there is. Secondly, Unions are fighting for the rights of workers in the face of increasing interference in politics by businesses who are only interested in increasing their profits while paying workers as little as possible. Is it any wonder that the Liberal Party has implemented heinous anti-worker laws, such as removing weekend penalty rates, reducing workers rights, low wages growth, and who can forget the destructive industrial relations legislation, Workchoices, under the Howard government which significantly disadvantaged workers and greatly favoured businesses. 10 years on and the Liberals persist with anti-worker policies(11). No wonder they target union donations while gleefully accepting business donations. Yet these short-sighted, profit-driven decisions have come back to bite businesses on their proverbial posteriors as Christmas spending is at its lowest since the Global Financial Crisis ten years ago(12). While the Liberal Party has tried to maintain the high moral ground while attacking Sam Dastyari, their double standards could not be clearer. It is obvious that they are as tainted as anyone else in accepting donations. To claim that donations have not influenced decisions over the years is to play the electorate for mugs. Australian democracy has been on sale to the highest bidders for years, greasing the palms of both Liberal and Labor. 1. The Sydney Morning Herald, Nick McKenzie, James Massola, Richard Baker, Labor senator Sam Dastyari warned wealthy Chinese donor Huang Xiangmo his phone was bugged, 29 November 2017, http://www.smh.com.au/federal-politics/political-news/labor-senator-sam-dastyari-warned-wealthy-chinese-donor-huang-xiangmo-his-phone-was-bugged-20171127-gzu14c.html. Accessed 17 December 2017. 2. ABC News, Quentin McDermott, Sam Dastyari 'tried to pressure' Tanya Plibersek not to meet with Chinese activist, 11 December 2017, http://www.abc.net.au/news/2017-12-11/dastyari-tried-to-pressure-plibesek-over-chinese-meeting/9244600. Accessed 17 December 2017. 3. ABC News, Chris Uhlmann and Caitlyn Gribbin, Malcolm Turnbull orders inquiry following revelations ASIO warned parties about Chinese donations, 6 June 2017, http://www.abc.net.au/news/2017-06-06/turnbull-orders-inquiry-following-revelation-asio-warned-parties/8592308. Accessed 17 December 2017. 4. ABC News, Anna Henderson and Stephanie Anderson, Sam Dastyari's Chinese donations: What are the accusations and is the criticism warranted?, 6 June 2017, http://www.abc.net.au/news/2016-09-05/sam-dastyari-chinese-donations-furore-explained/7816588. Accessed 17 December 2017. 5. ABC News, Louise Yaxley, Huang Xiangmo: Federal Liberals defend dealings with Chinese businessman at centre of Dastyari's downfall, 12 December 2017, http://www.abc.net.au/news/2017-12-12/liberals-defend-their-dealings-with-chinese-businessman/9251172. Accessed 17 December 2017. 6. The Courier, Eryk Bagshaw, Top Education: Company at centre of donations furore a beneficiary of streamlined visa program, 10 September 2016, http://www.thecourier.com.au/story/4155559/top-education-company-at-centre-of-donations-furore-a-beneficiary-of-streamlined-visa-program/. Accessed 17 December 2017. 7. ABC News, Rebecca Trigger, Chinese businessman subject of ASIO warning donated $200,000 to WA Liberals, 10 June 2017, http://www.abc.net.au/news/2017-06-10/chinese-businessman-asio-warning-chau-chak-wing-wa-liberals/8607372. Accessed 17 December 2017. 8. The Sydney Morning Herald, Heath Aston, Matthew Knott and Inga Ting, Mystery Chinese donor Zi Chun Wang tops political donations with $850,000 gift to Labor, 2 February 2015, http://www.smh.com.au/federal-politics/political-news/mystery-chinese-donor-zi-chun-wang-tops-political-donations-with-850000-gift-to-labor-20150202-133ofe.html. Accessed 17 December 2017. 9. Australian Electoral Commission, 2015-16 annual financial disclosure returns published today, 1 February 2017, http://www.aec.gov.au/media/media-releases/2017/02-01.htm. Accessed 17 December 2017. 10. ABC News, Henry Belot, Malcolm Turnbull announces biggest overhaul of espionage, intelligence laws in decades, 5 December 2017, http://www.abc.net.au/news/2017-12-05/turnbull-announces-foreign-interference-laws/9227514. Accessed 17 December 2017. 11. ABC News, The Drum, Greg Jericho, 10 years on, the spirit of Workchoices still lives, 21 March 2016, http://www.abc.net.au/news/2016-03-16/jericho-10-years-on,-the-spirit-of-workchoices-still-lives/7248368. Accessed 17 December 2017. 12. ABC News, Michael Janda, Consumer confidence dip points to unhappy Christmas for retailers, 22 November 2017, http://www.abc.net.au/news/2017-11-15/consumer-confidence-points-to-unhappy-christmas-for-retailers/9152452. Accessed 17 December 2017.